Usually, the dunning process is supported by an Enterprise Resource Planning (ERP) system to automate the complex procedure of keeping track of due dates for payments and monitoring payments made. Examples for typical ERP systems that offer an automated dunning process are SAP Business One6) and ADempire7) whereas the latter an open source ERP application is. All in all, it simplifies the work for persons in charge of the accounts receivable since once the allocation of each customer to a certain dunning term is done (see “customizing the automated dunning process”), everything is dealt with automatically by the ERP system: monitoring due dates and payments, printing dunning letters according to dunning level etc. application of fees and/or dunning interest rate. Hence, a company can decide how the letter head is designed, which fonts to use and which logo to insert. With dunning terms, a company determines different conditions for different groups of customers. 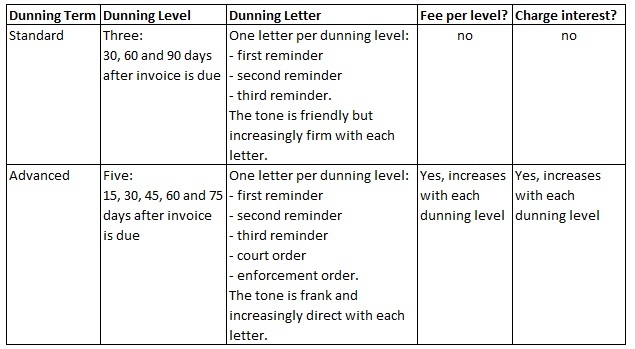 The dunning level defines which letters will be send after which period of time. For each level, a different content is formulated. Here the tone of the letter is adapted from level to level and further (legal) steps are stipulated. And finally, it can be defined whether and in which amount fees or interest rates will be applied. Dunning terms with their corresponding levels and interest rates can be chosen at will (see “customizing the automated dunning process”) depending for example on a country’s usual payment habits, customer groups or local laws. The dunning process is a very often necessary but tedious process to collect unpaid bills. To simplify the effort for employees responsible of accounts receivable, a dunning process should be automated with the help of an ERP system. see Plattner, Hasso; Zeier, Alexander: In-Memory Data Management: An Inflection Point for Enterprise Applications. Berlin-Heidelberg: Springer, 2011, p. 29.
see Bragg, Steven: Accounting Best Practices. Hobokon, New Jersey: John Wiley and Sons, 2010, p. 170.